You might be surprised to hear that Taco Bell actually has one of the healthiest fast food menus. Yep, in my Ultimate Guide to Macro Friendly Fast Food, I covered a handful of healthy options to get you started. But overall, they have a ton of options and room for customization. 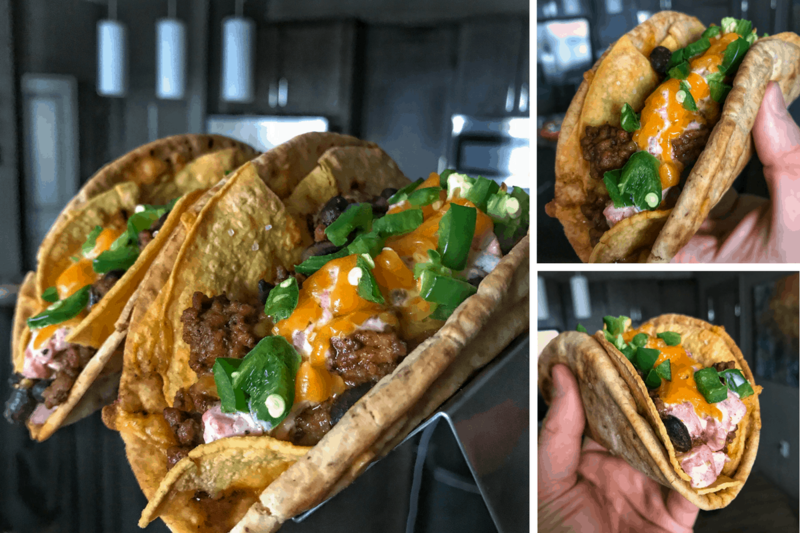 That being said, I was inspired to make this healthy Cheesy Gordita Crunch remix because it’s one of the more difficult menu items to improve nutritionally. 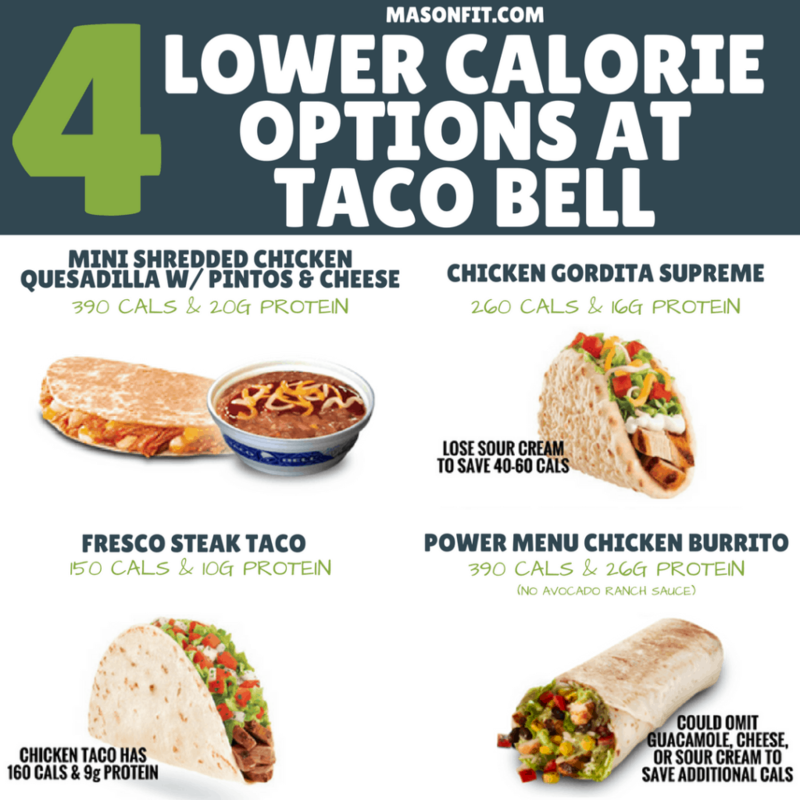 Taco Bell even has a nifty nutrition calculator on their site if you decide to check out my guide and add a few quick fixes to your food arsenal. Plan ahead! If you’ve never had the original, it’s essentially a hard shell taco with a spicy ranch drizzle that’s been wrapped in a chalupa-style soft tortilla with cheese melted in between the shells. My mouth is watering just typing that. But as you can imagine, the calories add up fast in the original version. 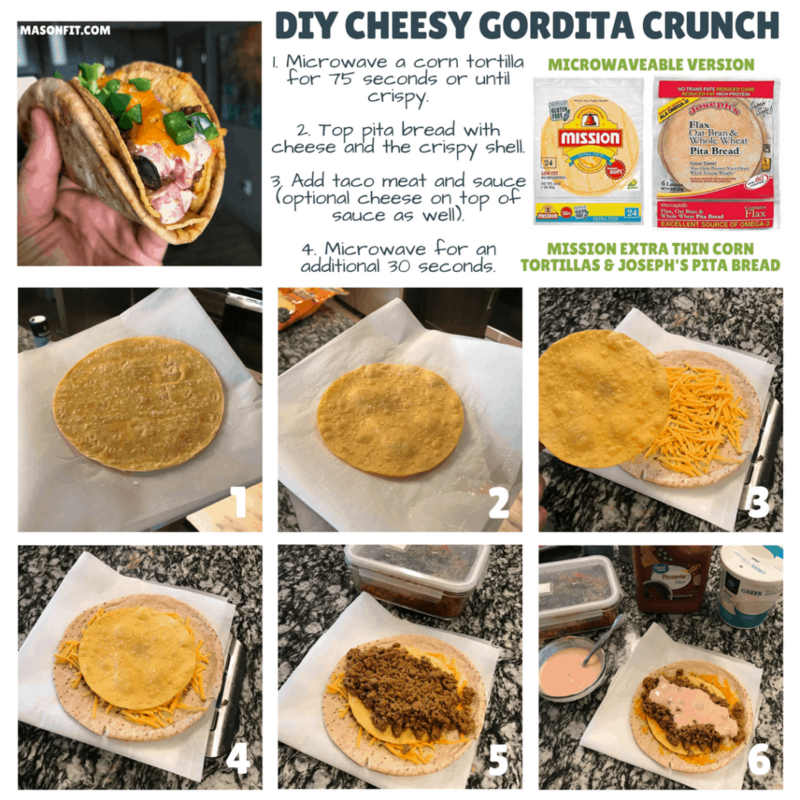 So, I’ve done my best to keep all the deliciousness of the original Cheesy Gordita Crunch while removing a ton of calories, increasing the protein, and decreasing the fat. I think I’ve done it, but I’ll let you be the judge. 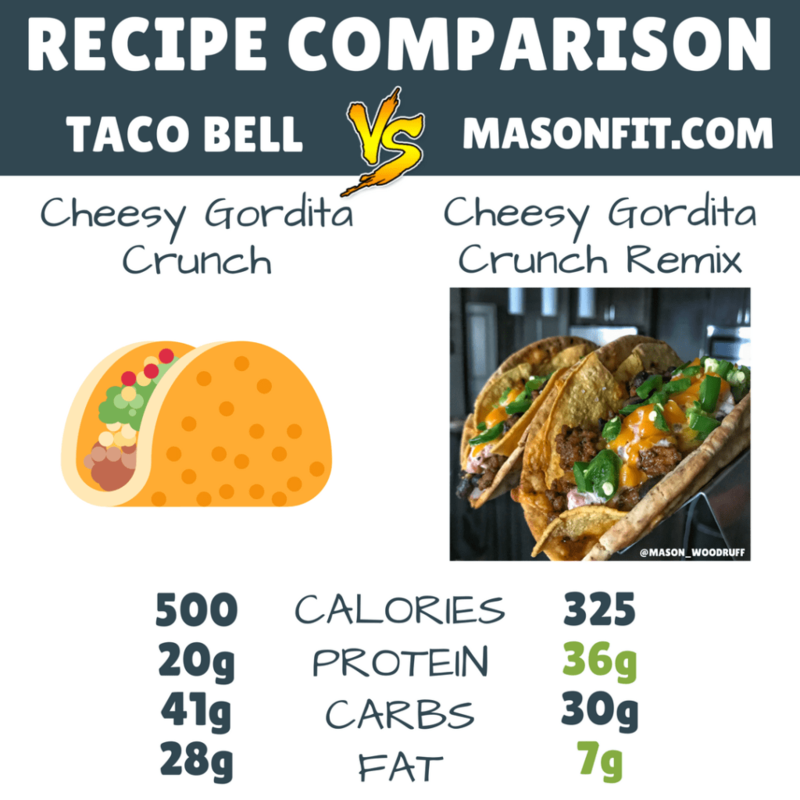 Here’s a look at how this healthy Cheesy Gordita Crunch stacks up to the original cheesy Gordita Crunch from Taco Bell in terms of nutrition facts. 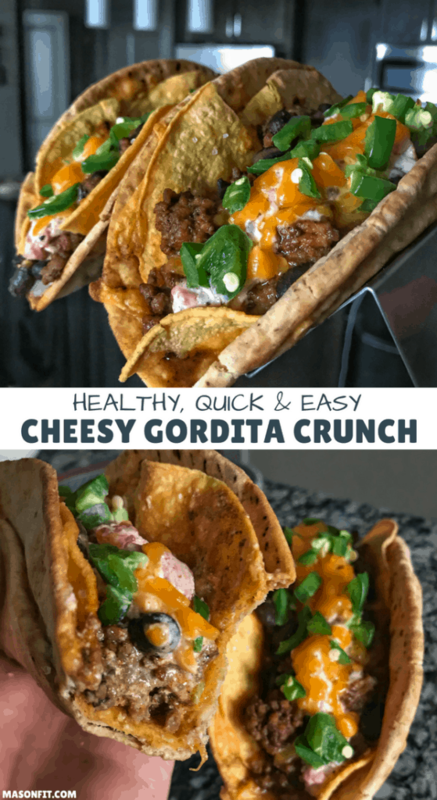 You could eat two of these healthy Cheesy Gordita Crunch remixes, which this recipe makes, without consuming half the fat in one original. Woo! You actually have a lot of customization with your own healthy Cheesy Gordita Crunch remix. I’ll briefly touch on a few potential ingredient swaps and things to consider for macros and nutrition facts. The world is your oyster when it comes to meat selection for your cheesy gordita crunch. As you might be able to tell from the photos, I added black beans to my taco meat out of habit. It’s just my go-to for adding a bit more volume to taco meat. One pound of 93/7 ground beef, one packet of taco seasoning, and one drained can of black beans is perfection. Alas, I’ve only listed the ground beef and taco seasoning in the recipe’s ingredients since most probably don’t want the extra carbs from black beans. But feel free to add them (and join the cool kids). If you’re tracking your intake closely, this section can be a bit tricky. The recipe calls for six ounces of cooked, seasoned ground beef. That means if you use a different cut of ground beef, drain the fat, use a different taco seasoning, or change any other variable, your weight and macros may change. So, I recommend weighing and tracking your meat on an individual basis if accuracy is important to you. One thing I’ll add here is that you could reduce the fat content even further or balance out the use of full-fat cheddar (more on that in a second) by using a leaner cut of ground beef. Instead of 93/7 ground beef, you could use a leaner cut of beef, ground turkey, or ground chicken. I’m in love with Joseph’s pita and lavash bread. They’re unbelievably soft and full of flavor for 60 and 100 calories per serving, respectively. In the case of this cheesy gordita crunch remix, we’ll be using a pita bread as the outer shell. You know, that kind of chalupa soft shell? Yum. As for the crunchy shell, you have a ton of options. The recipe calls for extra thin corn tortillas from Mission like I use for the low calorie tortilla chips. The recipe only calls for three tortillas, which will net you 120 calories. 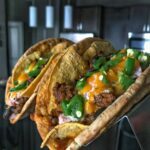 Alternative options include tostadas (Charras Baked Tostadas have similar macros), taco shells, or really any type of crispy inside that will melt to the pita bread via cheddar cheese magic. You’ll find the recipe has instructions for making the shell in the oven but if you’re in a hurry, check out the microwave guide below. Speaking of cheddar, the recipe calls for fat-free. The more cheddar you use in a recipe, the more significant the calorie difference becomes when using full-fat versus lower fat options. If you can’t find fat-free or don’t like the melti-ness (that’s not a word) of fat-free, you could use a reduced fat cheese, use a combination, or just go with full-fat. Calories don’t count unless you count them, right? If you use full-fat cheddar, your nutrition facts should look something like 429 Calories, 33 grams of protein, 28 grams of carbs, and 20 grams of fat per Cheesy Gordita Crunch. Okay, let’s talk spicy sauces. The original cheesy gordita crunch has a spicy ranch sauce. As you’d expect, it is not macro friendly. Adding a sweetener will balance out spiciness if you add too much cayenne or have a hot salsa. A tiny bit of lime in Greek yogurt is amazing. All right, I think that’s about all you need to know in terms of ingredients. Let’s get to the recipe. A lower calorie, higher protein spin on Taco Bell's classic Cheesy Gordita Crunch. While the corn tortillas get crispy, mix the Greek yogurt and salsa or Rotel and seasonings in a small bowl. Set aside. Place the pita bread on a baking sheet and top with 1/4 C (28g) cheddar on each. Save 1/4 C cheddar for a topping. Break two corn tortillas in half and one into four pieces. If you're using larger corn tortillas, you may be able to cover a pita with one tortilla. Cover the pita to its edges with the corn tortillas, leaving a gap in the center of the pita bread for folding. Add cooked ground beef to the center of each pita bread and top with the spicy sauce and remaining cheddar. If you want to add jalapeño peppers or other vegetable toppings, add them here. Place the finished pitas back in the oven for an additional 8-10 minutes until the cheese has melted and the pita is slightly crispy on the bottom. Using an even leaner cut of meat can make up for using full-fat cheddar or a mix of fat-free and full-fat. If you'd like to add black beans or other ingredients and would like to see an easy way to modify macros, check out this infographic. This recipe would be even more amazing with my homemade chorizo inside. 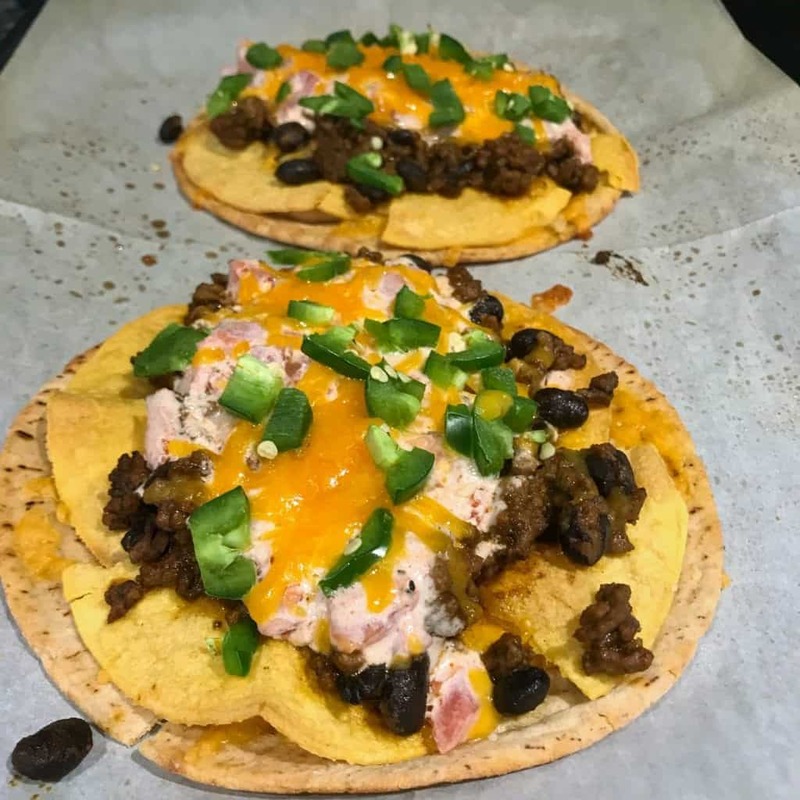 Ya know, as I was putting this recipe write up together, I thought about putting a low carb Doritos twist on things like in my Low Carb Doritos Pie recipe. Check it out and if you decide to replace the inner shell for some low carb fauxritos, be sure to tag me on my Instagram. And if you’re curious about what’s for dessert, you should download my free high protein cookbook for chocolate lovers. I’ve recently updated it to now include 20 of my most popular chocolate-packed high protein recipes. Check it out here or just enter your info below to have a copy sent directly to your email. Thanks for reading!